We were on the way to somewhere else when we noticed people lined up on a bridge over the Avon. Normally this riverbank would be a favourite for picnickers spending a lazy Sunday stretched out under a blossom tree. But today it is overgrown and neglected and guarded by a wire fence. Even the river looks sad and forgotten. And what were the people doing on this warm and sunny Sunday afternoon? 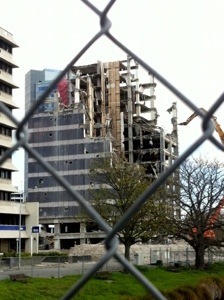 Watching the demolition of yet another Christchurch high rise. 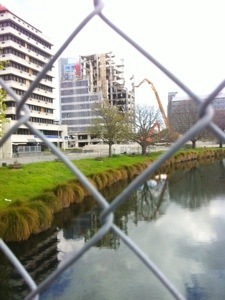 The time and effort it takes to smash down one concrete column – 15 minutes of fairly relentless grinding and bashing – makes you realise again the strength of the quake that toppled buildings like these in mere seconds. We watch with morbid fascination as the column shatters all over the ground and then squeal in unison as the bridge we’re standing on shudders with the impact. It’s easy to forget, when you don’t see it every day, that parts of our city are still very, very broken.